Johnny Cash (1932-2003) attracted myths like a big, square-shouldered magnet. It’s true that he was born in a clapped-out town in northeast Arkansas, that his father rode the rails looking for any kind of work during the dragged down early days of the Great Depression, and that when he was just a toddler the whole family took up and moved to Dyess, Arkansas, a town that was not a town, a New Deal utopia where bright promise beckoned. O the transporting, rapturous scene, that rises to my sight! Sweet fields arrayed in living green, and rivers of delight! There rocks and hills, and brooks and vales, with milk and honey flow. You might argue that the scenery depicted in the hymn sounds more like California than a swampy pine barren in northern Arkansas. And that would also be apt since California was, as Woody Guthrie sardonically celebrated, “a garden of Eden, a paradise on earth, so they say.” Beginning in the early 1930s, thousands of “Okies” (so-called because so many originated in Oklahoma) left their dust-covered farms and headed straight to the last-stop state on the West Coast, a place where “generous fruits” would surely never fail. It was the honeycomb, the beacon on the hill, to many a desperate duster. But Dyess and the other homestead communities so beloved of Eleanor Roosevelt (some bearing her name) carried their own charms (see The Tygart Valley Homesteads: Pioneers of the Great Depression on Homestead.org). What they offered to families like the Cashes was the allure of ownership, the jewel in the crown of American pioneering. The families had to work like hell (Cash started working in the cotton fields when he was five) to maintain the homesteads envisioned for them by the wiser minds of people who did not have to do the labor. But as with the more capitalistic homesteading initiatives that preceded these Depression-era social experiments, a certain tenure and level of good husbandry resulted in a property that would be deeded to the occupant free and clear. For the busted out and dusted out, that was something. 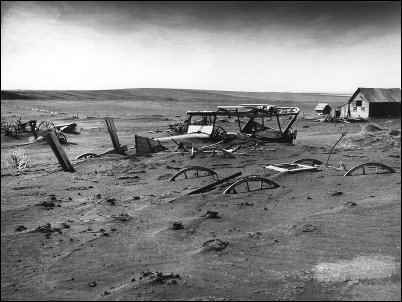 Much of our folklore is bound up in the Great Depression, in songs like Yip Harburg’s “Buddy Can You Spare a Dime,” Guthrie’s “Talking Dustbowl Blues” and “If You Ain’t Got the Dough-Re-Mi,” and novels like Steinbeck’s Grapes of Wrath. Only 80 years back, it was a national testing time, and the way out was never clear. Even now, hard-headed conservatives will argue that the New Deal should never have been struck, while families that lived through and beyond the worst of the 1930s and reaped the benefits of the National Recovery Act in all its various guises will shoot back that without the Roosevelts and the Deal, the country would have ground to a starving halt. As it was, with or without government interventions, the Great Depression spawned migration and migration meant two things — risk and change — the two building blocks of American settlement. 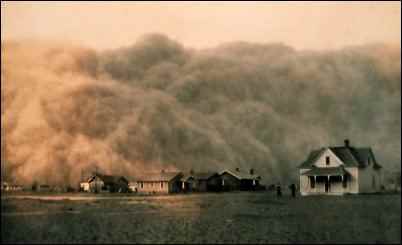 In the period between 1930 and 1936 the unintended result of earlier homesteading schemes was, as it were, laid bare: terrible dust storms swept across America’s mid-section, coating everything in fine soil, making food inedible, water undrinkable, life unlivable. By digging up the prairie grass, laying out large acreage to mono-cropping and failing to plant vital windbreaks, the sodbusters of the late 1800s had unwittingly set the stage for the collapse of farming in the region even as the Wall Street wizards set the stage for an economic collapse by buying and selling paper on the never-never plan. The nation fell into a cashless, jobless, homeless despond. One by one the trickle of travelers began, heading out from Alabama, Tennessee, Oklahoma, Texas, all the played out places, with bony mules and rattle-trap autos and tires bound up with straw, camping on roadsides, nursing their sick and sometimes burying their dead, and creating as they went a mobile culture, a paradoxical progenitor of today’s RV vacationing. There was nothing romantic about the scene yet along their desperate way, the Okies showed us that the country was not as big as all that, inviting the later building of roads, tourist courts, diners, cathouses, monuments, cider stands and national parks. The destination was anywhere where times were less hard, where a person could work and be paid, where parents could feed their children. Those who made it to California seeking Eden were nearly always disappointed. 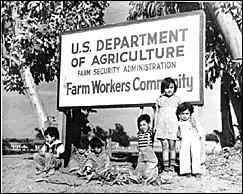 The state turned people away at the border, and those who got in were put to work in orchards and fields at pittance wages and housed in ditches. A state well accustomed to abusing its “guest workers,” California proved a disagreeable host. 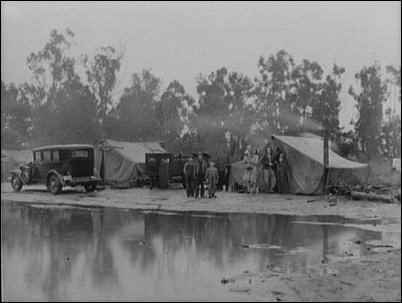 Here the New Deal charged in again, setting up large, decent government-run camps where families could rely on hot showers, flush toilets, and breakfast for their kids. The hard-working refugees from American poverty hung on tenaciously in their Eden, proving that good men would rather work for pennies than watch their families starve. A sizeable number went from ditch camps to government camps to rented houses to mortgages and a stake in California’s future. They moved from risk to change to permanency in a few traumatic years, not unlike their forefathers who, arriving in the New World, hewed out log cabins and hacked houses out of sod blocks. But in accepting government hand-outs, the Okies brought opprobrium on their heads yet again. “Okies were viewed with such suspicion that they were even equated with that entity most terrifying to Americans: Communist spies. The mayor of Brawley, California said of the camp near his town that “[t]he whole proposition [was] Communist through and through. It [stunk] of Russia.” (“Okie Life in California”). Oh yes, it stank of Russia all right, because from their necessarily myopic viewpoint, pushed and pinched American workers in the cities and coal mines and dirt farms noted in that in Russia, the inheritors of the Revolution were housed, were working, were eating. Though the view was skewed, it inspired a lot of people to picket, to pamphlet, and to palaver. 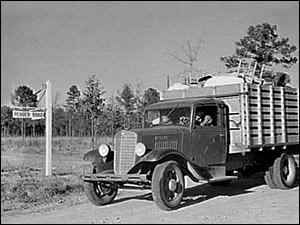 Oh yes, there were some socialists, anarchists, commies and fellow travelers on the road from Dust Bowl to Fruit Bowl, no doubt. 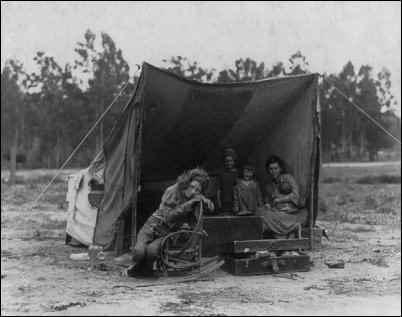 Who would not abandon the Hoovervilles (tent cities) of the early Depression years for the “Rosy-villes” [my term for the Roosevelt settlements] of the New Deal? Who would not trade degrading poverty that cannot feed its own for the dignity of an occupation, a roof, a porch, a piece of land to plough? The New Deal for some seemed a logical extension of the American dream, not an antithesis to it. Rosy-villes were created in 17 states, each with their own regulations and all with Federal oversight (Strissguth describes that at Dyess as “Orwellian”). The Matanuska settlement in Alaska drew farmers from Wisconsin and Minnesota. The Houston Garden project was established for urban blacks (“garden” referencing the green spaces incorporated into the design) and Aberdeen Gardens in Virginia was called a “blacks for blacks” initiative, allowing for African American participation in both planning and constructing the estate. 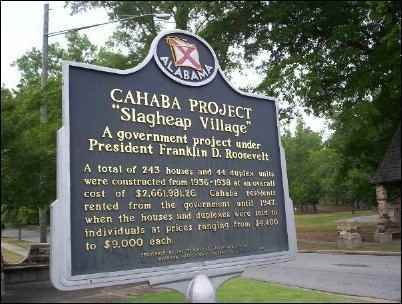 Like Cahaba, in Trussville, Alabama, these so-called “rurban” estates became and have remained desirable neighborhoods. Some were segregated in the other extreme, set up only for whites, and, in the case of Matanuska, only for Protestants. At the Dyess community, curiously, Pentecostals were excluded (the Cashes were Baptists). Most settlements were later disbanded or abandoned. Disbandment could take the form of a withdrawal of Federal support coupled with the possibility for the occupants to buy their own homesteads and live like regular folks (as in the still extant Tygart Valley Homesteads in West Virginia). Or it could take the form of the bread-winner of the family migrating once again when paid labor began to reappear as the country geared up for World War II. Men would go away to work in factories and eventually send for the family, leaving the little white houses in places like Dyess to fall into decay. The latter was more likely to happen when occupants were not owners or potential owners, but in part the outflow was simply another phase in the development of modern civilization. Some settlements have kept a community center or other building as a museum commemorating the New Deal projects, and have attempted reunions and story gathering exercises to re-create something of the original communal spirit of these interesting historical places. In Gee’s Bend, Georgia, African American women continued and expanded the traditional art of quilting, producing unique and still sought-after artworks. 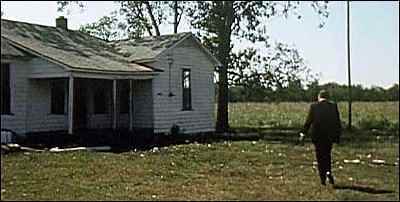 The Johnny Cash boyhood home will be a central feature, as can be imagined, and concerts have been held to raise money for that venture. Not exactly Graceland, the Cash home was little more than a white-washed shack. But it will stand as a fitting tribute to someone who grew up very, very poor, who came by those big shoulders and powerful hands in honest, unenviable toil from toddler-hood to his teens, and who deserved his man-sized portion of fame. Like so many others unknown and unsung, Johnny proved the American dream.